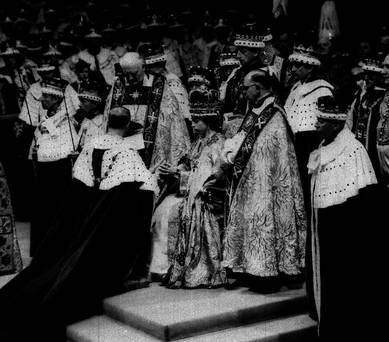 Queen Elizabeth II at her Coronation in London's Westminster Abbey June 2, 1953. Royal watchers are in a bit of a frenzy over Queen Elizabeth's future. Might she be planning to abdicate? Here are some reasons why she mightn't. British monarchs don't abdicate: Victoria reigned for 63 years. Elizabeth has never got over the shame she experienced when she was 10 and her uncle, Edward VIII, chose love over duty when the government barred him from marrying Wallis Simpson, his mistress, who had two living ex-husbands. When Elizabeth was 21, she vowed in a radio message to the Commonwealth that "my whole life, whether it be long or short shall be devoted to your service". While other European monarchs are just inaugurated, the British monarch is crowned and adorned with regalia of deep symbolic significance, including a ring which marks his or her "marriage" to the nation. Lord Norton, a respected professor of government, sees abdication as "completely alien" to the British system and its law; without a legal change, she must remain queen till she dies. The queen is very religious and has a great sense of duty. She is not a quitter. Prince Charles's wife, Camilla, Duchess of Cornwall, has a living ex-husband and was Charles's mistress while Diana was alive. And here are some reasons why she might. She's had her Diamond Jubilee, which has reinforced her personal popularity and that of the monarchy. There can't be another such anniversary. She's 87, Charles is 64, his heir, Prince William, is 30, and in July his first grandchild is due to appear on the scene. If the queen lives as long as her mother, she'll be around until she's 101. It's hard to see the British public getting into a state of ecstasy over the coronation of a man of 78. The public have come round to Prince Charles after a very rocky patch, but if he doesn't inherit soon, there will be increasing pressure to skip a generation, which none of the family wants. Queen Beatrix of the Netherlands, a mere 75-year-old, abdicated in April to make way for Willem-Alexander (46) and reverted to being Princess Beatrix. It all went smoothly, the Dutch seem perfectly happy about it and it has led to questions being asked in the UK about why it can't happen here. Following a popular precedent, couldn't the title of Her Majesty Queen Elizabeth The Queen Mother be revived? She could still carry out public duties. If that argument could be discounted on the grounds that abdication is a Dutch thing, didn't the abdication of Pope Benedict have a profound influence? Popes used to be crowned and didn't abdicate, but Pope John Paul I changed the ceremony to a simple inauguration, the papal tiara is no longer ever worn, and Pope Benedict just gave up his job because he no longer felt up to it. The Roman Catholic Church didn't implode, indeed it seems revived. Elizabeth is still robust, but she and her 91-year-old husband, on whose support she relies heavily, have begun to find overseas engagements taxing. She loves the Commonwealth and hasn't missed a heads of government meeting since 1973, but she's delegated to Charles the job of attending November's gathering in Sri Lanka. The queen likes tradition, but she's a pragmatist who modernises the monarchy to preserve its future. Like the Sicilian prince in Giuseppe de Lampedusa's magnificent novel, The Leopard, she knows that "everything must change so that everything can stay the same". At the moment she's succession planning. Last June, at the climax of the Jubilee celebrations, she appeared on the Buckingham Palace balcony to wave at the huge crowd in The Mall accompanied not by the usual spread of royals but with only five others. Philip was in hospital, and she had with her just Charles and Camilla, William, Kate and Harry. It was the clearest of clear symbols that they were the core of a pared-down royal family. It also indicated that Camilla has passed her royal tests and is now accepted. Last week, at the state opening of parliament, the message was reinforced when Charles and Camilla sat on thrones beside the Queen and Prince Philip. The couple's performance in Sri Lanka will be closely choreographed and scrutinised, not least because it is the queen's desire that Charles prove acceptable as a future head of the Commonwealth. My guess is that she will have already discussed with the prime minister what parliamentary action would be necessary to make abdication legal and if there are likely to be problems of succession with any of the other 15 countries of which she's head of state. The day she decides that the best interests of the monarchy will be served by her stepping down, I'm sure she'll be off as soon as possible to spend more time with her horses and dogs.